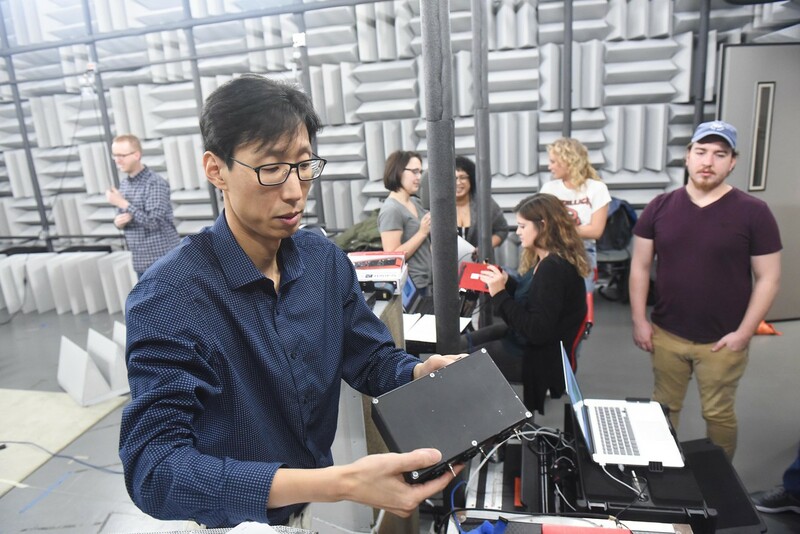 Dr. Doyuen Ko and students work in the anechoic room at Belmont University in Nashville, Tennessee. Dr. Doyuen Ko, associate professor of audio engineering in Belmont University’s Curb College of Entertainment and Music Business, was recently awarded a $350,000 grant for a study he’s pursuing on digital preservation of aural heritage in conjunction with his colleague at Rochester Institute of Technology (RIT). The second largest grant recipient of 253 humanities projects to recently receive grants from the National Endowment for the Humanities, Ko’s work will digitally replicate the acoustics of historic structures, including legendary Nashville Music Row studios, to establish protocols for preserving the aural heritage of culturally significant sites. Dr. Doyuen Ko and students work in the anechoic room. Aural heritage preservation is a form of heritage conservation that documents and recreates the auditory experience of culturally important places, enabling virtual interaction through physics-based reconstructions of acoustical dynamics. A two-step process is involved in aural heritage preservation. First, researchers must capture and document the acoustics of a space and then create virtual acoustics using captured data via digital audio technologies. The researchers will develop, test and share their aural heritage process via three case studies, which represent culturally, architecturally and temporally distinct examples of endangered aural heritage: 1) Columbia recording studios on Nashville’s historic Music Row; 2) the Rochester Savings Bank, which is listed on the National Register of Historic Places; and 3) the interior architecture of the 3,000-year-old UNESCO World Heritage Site at Chavín de Huántar, Peru. Belmont University is uniquely equipped for the Music Row studies in terms of geographic location and facilities, including a hemi-anechoic chamber and a 250-seat film sound mixing stage with a DOLBY ATMOS immersive audio system, the first university-based installation in the world. In addition, the college owns and operates two historic recording studios on Music Row, Columbia Studio A and B, which will be preserved and auralized in the project. From their opening in the mid-1950s, the Columbia studios provided the sonic landscape for many of that generation’s biggest hits and greatest artists, including Bob Dylan, Johnny Cash, Patti Page, Elvis Costello and Simon & Garfunkel. The research team anticipates completing the stated goals of the project within three years.